Matthew Rick, owner of Infinity Beverages, says his business needs room to grow to meet demand. Infinity Beverages can no longer keep its success bottled up. 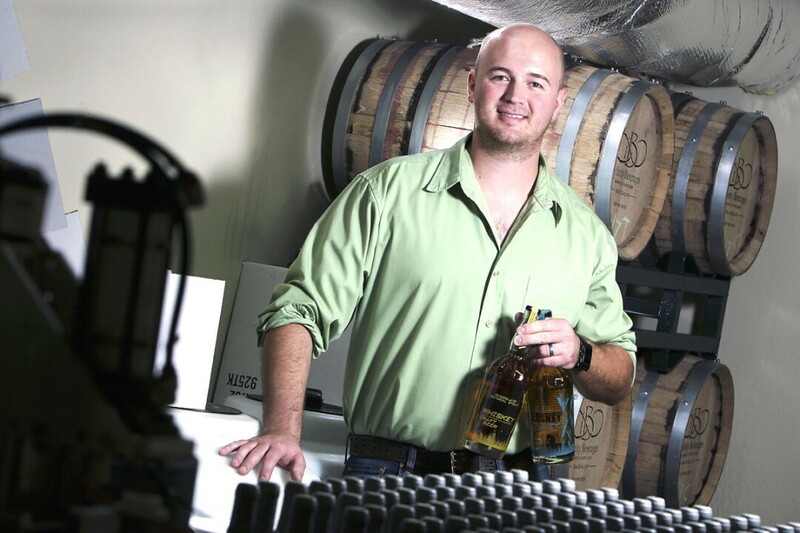 Motivated by rising demand – as well as a desire to create new products and reach new customers – Eau Claire’s only winery and distillery plans to relocate to a newer and much larger space, says owner Matthew Rick. Like the distillation process itself, the relocation won’t be instantaneous, but it will be worth the wait. Infinity Beverages plans to move by next June from Banbury Place, where it opened in 2012, to 3460 Mall Drive, the former location of Coffee Grounds. “As you can tell, we’re kind of packed back here,” Rick said on a recent afternoon as he stood amid the equipment at his current space, which includes a still with a 26-gallon boiler (which is tiny by industry standards), huge plastic casks full of fermenting wine, glass jugs of partially distilled spirits, and bottling equipment. You can spy the production area through a window behind the bar in Infinity’s cozy tasting lounge, where patrons can sample the company’s libations. Including an additional storage unit for finished product, today Infinity occupies about 3,000 square feet, while the new space will offer 17,000 square feet. The current location has the capacity to produce only 3,500 cases annually, and demand is growing rapidly enough that Infinity would run short of wine next year unless it found a larger production space. In the new space, Rick expects to be able to make 15,000 to 18,000 cases of wine and spirits each year. The building’s soaring ceilings – 20 feet high in some places – will accommodate a larger, taller still and much bigger stainless-steel tanks for wine fermentation. They’ll also accommodate better amenities for patrons. Rick has plans for a 1,000-square-foot mezzanine overlooking the production area, as well as of an outdoor patio where patrons will be able to sip some of his specialty creations. Currently, Infinity produces five “signature” grape and fruit wines, two port wines, two whiskeys, and vodka. In the near future, Rick plans to release two infused vodkas, one with vanilla bean and espresso, the other with red chili peppers and cracked black pepper. After the move, Rick anticipates being able to expand his product line much more to include more flavored vodkas, fruit vodkas, and perhaps even a maple syrup-flavored rum. “I do things a little bit differently than a lot of people do,” Rick noted when describing his product line – and that’s a bit of an understatement. His whiskey is distilled from craft beer (thus the name, Beerskey); he’s produced wine aged in whiskey barrels; and he’s made apricot wine with pureed apricots, not juice alone, for a fuller flavor. While there are no plans to turn the new tasting room into a traditional bar, Rick expects to serve more specialty cocktails made with Infinity’s products in addition to a small amount of food (think locally sourced cheese and breads, for example). He’ll also be adding staff to accommodate longer hours and increased production. Business has grown rapidly in recent years – Infinity products are now carried by 50 to 60 retailers, as well as sold on site and online – and Rick hopes the new location only accelerates that trend.